Do have lots of recipes laying around and nowhere to put them? I do and they are all different sizes from recipes cards, recipes printed off my computer and pages from magazines. The best place to keep these is in a recipe organization binder but with all the different shapes and sizes it can become daunting to figure out an easy way but don’t worry I’ve got you covered! 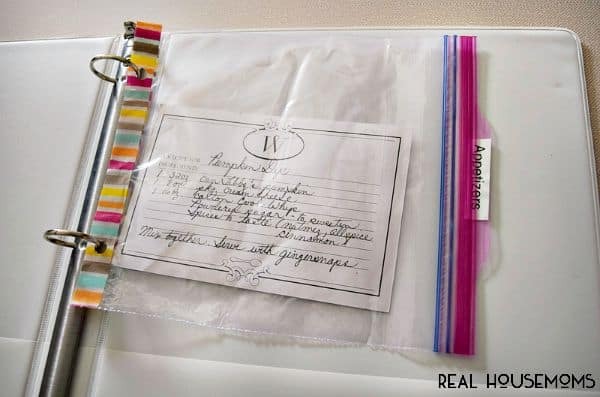 Recently I was on the Ziplock website and found this great way to keep them all together and organized. The best part it took me less than an hour to put it all together. 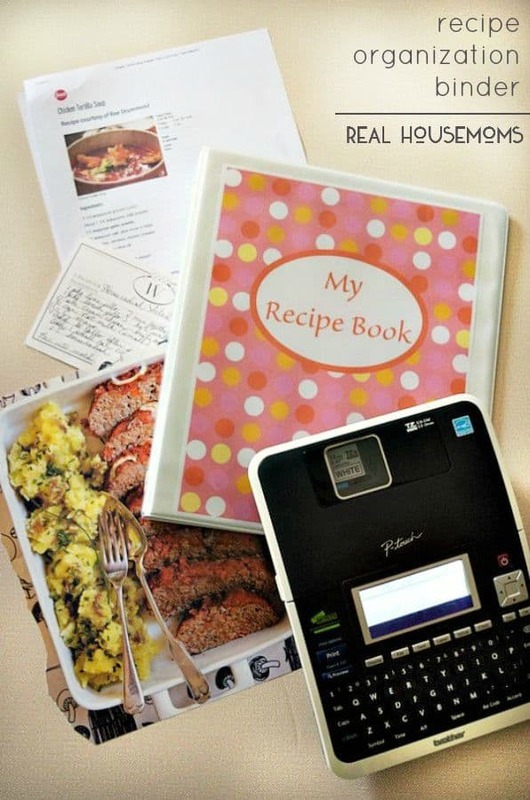 Here is what you will need for this easy DIY Recipe Organization Binder. The first step is to take all of your recipes and sort them into categories. This way you will know how many bags to make for your binder. Here are my recommendations to start with. You might find you want to further separate some categories if you have a lot of recipes for instance desserts can be divided into cookies, cakes, and pies instead. Now you’re ready to put your recipe binder together. Take your ziplock storage bags and cover the seam of each bag with duct tape. This will prevent the bag from ripping when you punch it and use it in your binder. Using your 3 hole punch alternate your bags by punching 1/2 in the top two holes and the other 1/2 in the bottom 2 holes. This allows them to alternate like dividers. Next, take your label machine and print out your recipe categories. place them on the tab of the Ziploc bag. Make sure you have the bag with the tabbed edge in the back so it opens in front of the tab. Place your labels on. Make sure if you want your tabs in a particular order you alternate the bags with the top holes and bottom holes. 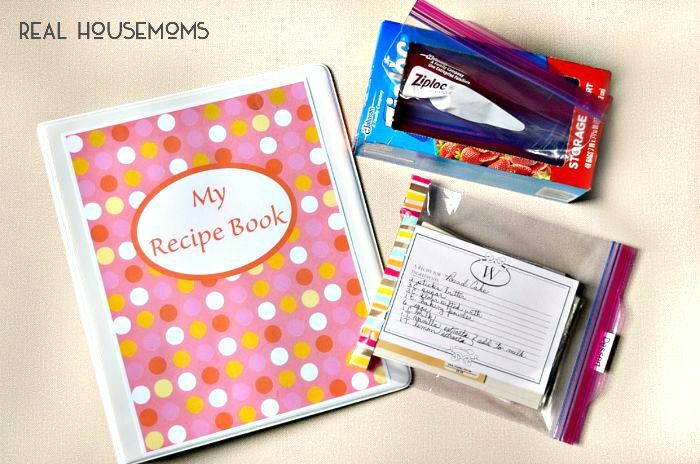 Place all your recipe cards and folded printouts or magazine recipes into the appropriate bag. Place the bags in your binder and you are done! I made the cover for my recipe organization binder on my computer using Microsoft Word, or you can find lots of printable ones online by searching free printable recipe binder cover. 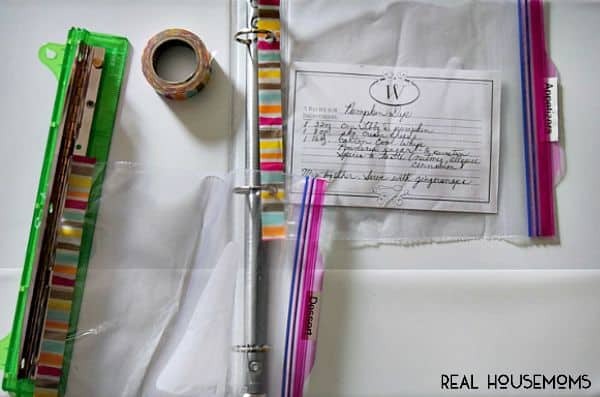 If you want to see more here are 15 Unique Ways to Use a Ziploc Bag and all my other Organization Tips. Get more great tips like these on our Real Housemoms Life & Kids pin board! Wow that is pretty smart on organizing recipes! My wife just recently started collecting recipes from different family members and this will really help organize them! Thanks for sharing! It’s a good ideea to have a recipe organization binder, especially if you have a lot of recipes, and you’re afraid to not lose them. Wow such a nice idea. It will help me a lot. Thank you for sharing!